Amazon Smile is one way to help the Chorale when you purchase items from Amazon. 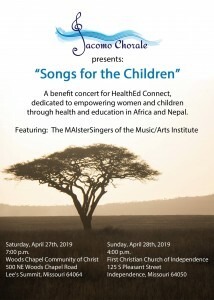 The JACOMO Chorale is directed by Dr. Helena Vasconcellos and accompanied by Michelle Proen. For additional information, please contact Nancy White at (816) 560-9148. 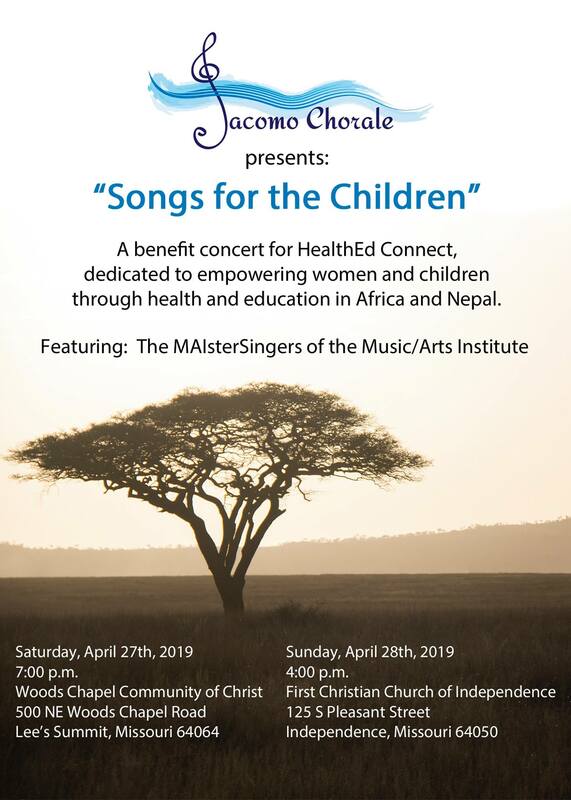 The JACOMO Chorale is a 501(C)3 not for profit organization. The JACOMO Chorale is a non-auditioned community chorale and is always interested in adding additional members. Voice placement for prospective members is conducted by Dr. Vasconcellos, the Chorale’s director. The Chorale rehearses from 7 to 9 PM at Mission Woods Community of Christ, 2800 Duncan Rd, Blue Springs on Thursday evenings and presents two to four unique concerts per year. For additional information, please contact Nancy White at njwhite1973@gmail.com or phone (816) 355-0114 or (816) 560-9148. The JACOMO Chorale performs at a variety of venues in the Kansas City area. See the Schedule page for further details and for information about past performances. 1. Sing a tune which he or she feels comfortable, such as a church hymn, a folksong, a belcanto/operatic piece, a jazz standard, or even a popular song. 2. Sing “Happy Birthday” in three different key signatures. 3. Describing his or her level of comfort with written music. Regardless of the skill level of the prospective singers, they will be invited to attend the first rehearsal in order to have an idea about the pace of practices and the level of expectation on the part of the conductor as well all the other members. Please call Nancy at (816) 560-9148 for additional information. Comments are always welcomed. Use the space below to contact us. I’m interested in joining the chorale but I believe I’ve missed the auditions. Is it still possible to join? When will the next auditions take place? Our next rehearsal for our spring concert will be this Thursday (17th) at 7 pm at the Woods Chapel Community of Christ. Checkout the website for details to call our manager, Nancy White.